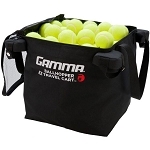 Pick up and transport pickleballs from all over the court with ease. Tennis Court Supply carries Pickleball ball hoppers, travel carts, and hopper bags so you can clean up and collect balls in no time. The Ballhopper Hi-Rise Gold is a durable and easy-to-use ball pick-up that holds up to 55 pickleballs. 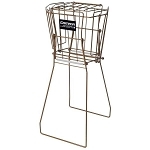 Its handles fold down to stand the basket at hand height for easy reach. 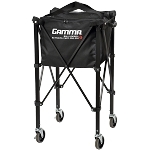 The GAMMA EZ Travel Cart is a wheeled Pickleball carrier that holds up to 120 pickleballs, and we also have additional Ball Hopper EZ Travel Cart Bags that snap securely to the cart so you can simply replace a full bag and carry even more pickleballs. Tennis Court Supply has everything you need to build and maintain a top-of-the-line tennis or Pickleball facility. Browse our catalog and feel free to contact us with any questions. © Copyright Tennis Court Supply. All Rights Reserved.